t’s not very often that I come up with a recipe idea and I’m completely happy with it first time. I’ll often fiddle around with the rations and tweak a recipe until it’s just right. But this time I nailed it! I love Mexican food and I am often trying to find new way to play with the chilli heat, tang of the lime and sweetness of corn that you often find in a Mexican inspired dish (take these Mexican Salsa Cous Cous bowls as an example). So, a couple of weeks ago when I was throwing together some rather simple tacos with a friend, I took her advice and mashed up a roasted sweet potato with some feta. We used the mix much in the same way as refried beans and served it alongside a traditional beef taco and salsa. It was delicious! Ever since then, I’ve been trying to come up with ways in which I could jazz up the simple combination of sweet potato and salty feta – and here it is, Roasted Red Pepper and Sweet Potato Quesadillas. I genuinely think this might be one of my best quesadilla recipes yet! The key Mexican flavours here are the Sweet Potato (which originates from Central/South America), sweet red peppers (native to Mexico), chilli, lime and coriander. Feta may seem a bit of an odd addition to the mix but Queso Fresco and Queso Blanco (two cheeses commonly used in Mexican cooking) aren’t all that dissimilar. Queso Fresco and Queso Blanco are fresh, soft, white cheese with a crumbly, firm and smooth texture. Often made from cows milk (though sometimes with goats milk) they hold their shape when heated rather than becoming a liquid, gooey mess. Although saltier, this makes feta a good substitute for Quesco Fresco and Queso Blanco. Moving on from thoughts of cheese…the main reason I love this dish is because how vibrant and warming it is. The orange of the sweet potato and bright red of the sweet peppers and chilli’s just fill your heart with warmth making this comfort food territory. It’s also a fabulous fall recipe for when the nights start drawing in, but you’re not quite ready to be tucking into hearty stews just yet. You’ll see from the picture we also served this with a sauce – it’s a simple mayonnaise mix flavoured with extra chilli and lime that can be stirred up in seconds. Although not essential, it does give an extra hit of flavour. 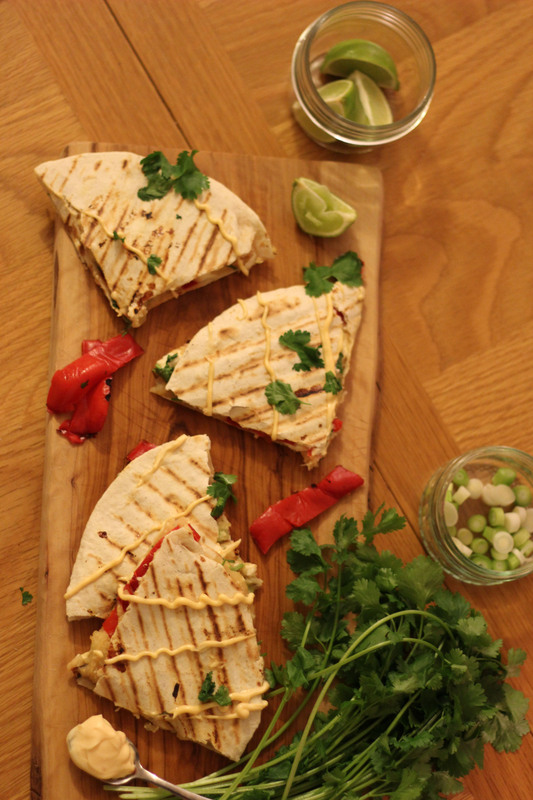 These quick and easy quesadillas are great as part of a Mexican feast or as a tasty lunch. Turn your oven up to a high heat (at least gas mark 6) and place the red pepper and sweet potato into the oven. Leave these to roast for 30mins until the sweet potato is soft and the pepper has begun to blacken. Once the pepper and potato have roasted remove from the oven to cool slightly. Scoop the potato flesh from the skin and add to a bowl with the sliced pepper and spring onions before stirring in chilli, juice of the lime, coriander and crumbled feta. Stir the mixture well so the flavours are evenly distributed. Place the first flour tortilla into a griddle pan on a medium heat. Spread the potato mix oven the tortilla evenly and top with the second tortilla. Heat the quesadilla for five minutes on both sides before serving. For a quick dinner, cut the pepper in half and blacken in a hot griddle pan. The sweet potato can also be softened in a microwave on high heat for 10 minutes. 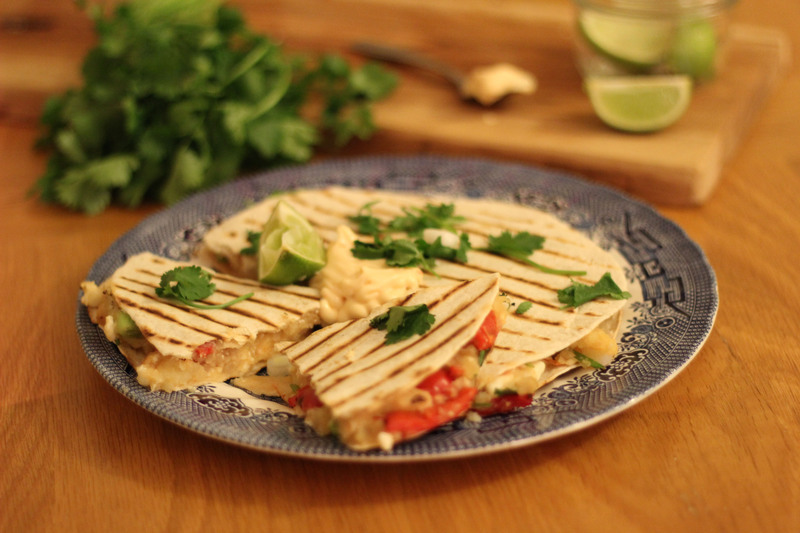 *If you are feeling a little health conscious I’ll let you in on a couple of secrets which will help make this a healthy Quesadilla recipe – choosing a low calorie tortilla wrap and reduced fat feta will help make for a lighter meal. Another alternative is to serve half a Quesadilla with salad rather than eating a whole one to yourself. Is Mexican food a particular love of yours? 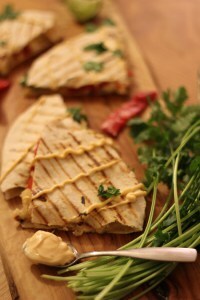 Do you whip up quesadillas for a quick dinner or do you prefer tacos and burritos? Wow that looks so nice. My kids are pretty unadventurous when it comes to spicy food but they make an exception for Mexican. Definitely going to try this out, thanks for posting. Hi Joanne I was the same when I was younger. But mexican really brought food to life for me 🙂 I hope they enjoy it!! I love Mexican food too and these sound right up my street, especially being vegetarian. Weirdly though, I’v never made quesadillas. If I do, I think it might be your recipe I’ll be trying.